I’ve never made homemade popcorn balls before — although we’ve happily eaten them as part of various gift baskets over the years — so when Good Cook asked if I’d like to try their popcorn ball-making kit for our series, I was excited to give it a try. Although there are “classic” recipes for popcorn balls that call for a more complicated mixture of corn syrup and other ingredients, I decided to cheat and use the simpler marshmallow version. Not only is it easy, but anything that calls for a bag of mini marshmallows is a winner in my opinion. 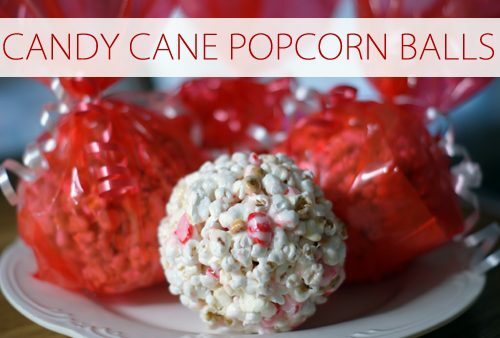 Add a few candy canes (or, ahem, peppermint star mints) mixed in for a fun holiday treat! Save 25%off the popcorn baller from Good Cook with coupon code POPCORN, and enter to win the Good Cook 7-Day Popcorn Giveaway here. Pop popcorn and crush candy canes ahead of time. Mix together in a large bowl. In a medium saucepan, melt butter over low heat. Add marshmallows and stir until completely melted. Pour the melted marshmallows over popcorn mixture and toss with a spoon. Scoop popcorn into the popcorn baller and press down with the lid (or shape with well-buttered hands). Release the popcorn ball onto a sheet of wax paper to harden.